And through her creativity, Pfarelo Ramashia is making a name for herself. 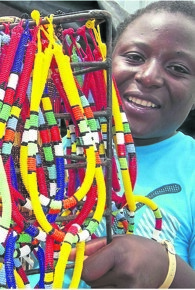 The 28-year-old from the Mudene Village in Thohoyandou, Limpopo, makes attractive traditional dresses, earrings, bracelets and necklaces. She started making traditional clothes, beads and fashion accessories in 2013. Pfarelo said the extra money came in handy when feeding her kids and paying for their school fees. “That’s why I requested my friend to teach me the skills of the business, so I could make extra cash,” Pfarelo said. She said after mastering the skills, she started operating her business at a Thohoyandou shopping centre. “I’m happy that my business is growing almost everyday. My customers come from as far as Jozi and Botswana,” she said. She advised unemployed women to start their own businesses.